For many years, fishermen in the North Sea, between Britain and Denmark, have found fossil bones in their nets. This fossil catch has yielded over 200 tons of fossil bones, and over 15,000 mammoth teeth. The bones include remains of mammoths, three different species of woolly rhinos, hippos, lions, bears, wild horses, bison, elk, reindeer, hyenas, wolves, and Sabre tooth cats of at least two species. They tell us about a whole community of animals. Beneath the North Sea lies a lost landscape. This land was as big as modern Britain - hills and valleys, rivers and forests, marsh and moor. Sometimes warm and marshy, and at other times a frozen tundra. This has been named "Doggerland". 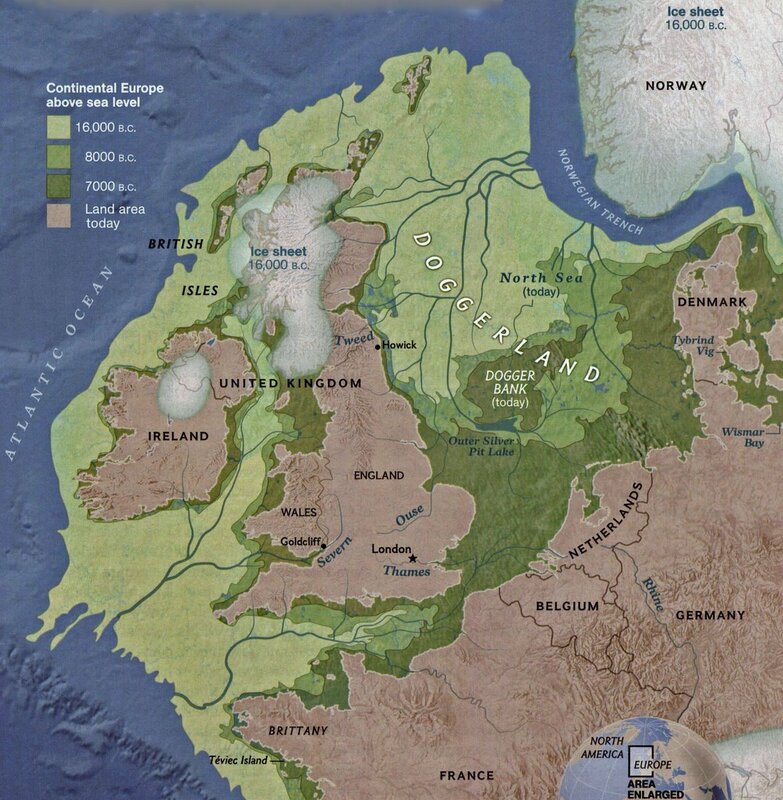 "Doggerland" is a name given to a vast lowland plain, with the northern coastline stretching from Shetland to Jutland. The Thames flowed into the Rhine, which turned south, and made the English Channel its estuary. The highest point was a hilly region where the Dogger sand-banks are today. It was finally flooded by rising sea levels around 6,500 BC.